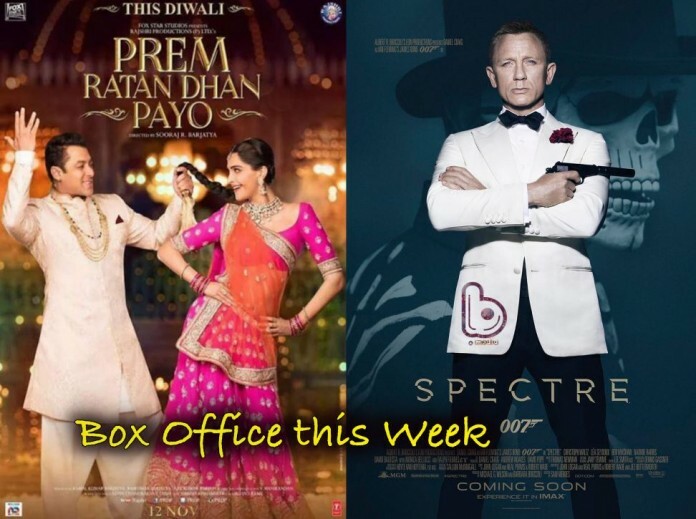 Spectre and Prem Ratan Dhan Payo are competing at Box Office this weekend. Prem Ratan Dhan Payo 10th Day Collection- Salman Khan’s PRDP holds well while Spectre is super strong at the domestic Box Office. Salman Khan’s Prem Ratan Dhan Payo is holding well at the domestic Box Office in its second weekend. After a low 2nd Friday, the movie witnessed a decent growth at the box office on 2nd Saturday. As per the early estimate, Prem Ratan Dhan Payo collected around 6.7 crores on its 10th day, thus taking the total box office collection to 184.12 crores. With a comprehensive collection of 185.02 crores, PRDP is already the second highest grosser of 2015 behind Bajrangi Bhaijaan (321 crores). The movie has also become the 11th highest grosser on its 10th day beating the lifetime collection of Bang Bang (181.3 crores). Talking about this week release Spectre, the movie registered the best opening for a Bond film in India. After a glorious opening day with the collection of 6.2 crores, Spectre witnessed a decent growth on Saturday and collected around 8.5 crores. Spectre is performing exceptionally well in multiplexes and metros. The movie remains the first choice for the viewers in top metros like NCR, Mumbai, Hyderabad and Bangalore. Spectre will dominate Prem Ratan Dhan Payo in these regions for coming days. Though, PRDP has recovered its big budget of 115 crores and has been declared a clean hit still the movie underperformed at the Box Office. The expectations were enormous, but the movie fell flat after a grand opening weekend. PRDP will make it to the 200 crore club in its third week; that is average considering the performance of Salman’s last two release – Kick and Bajrangi Bhaijaan. Vote now and tell us your opinion on the lifetime collection of Prem Ratan Dhan Payo?